The Public Works Department, Water Division is responsible for operation and maintenance of the water treatment plant and water distribution system. Water is obtained from an underground aquifer through wells and pumped to the water treatment plant. At the plant, water is treated for removal of iron and manganese and supplemented with chlorine, fluoride and corrosion inhibitor and pumped to underground storage. 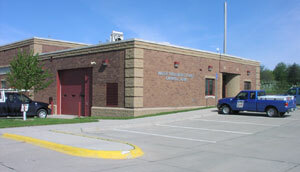 High service pumps withdraw the water from underground storage and pump it to the distribution system and water tower. The Water Division is staffed by a Water Superintendent, three Plant Operators, a Meter Service Worker and a Utility Service Worker.